Farro piccolo is milled only by Anson Mills, a cherished South Carolina source of grains. You can order it from their website, or find another farro varietal in your neck of the woods. This preparation is like fried rice but with all the nutritional robustness of farro. For a complete meal, serve farro with poached eggs or grilled or roasted meat. Preheat the oven to 375 degrees. Spread the dry farro on a sheet pan and toast it until a little brown, about 10 minutes. Toasting the farro will enhance the flavor. Coarsely chop the dark greens. In a medium saucepan, bring 3 cups of water to a boil and add the greens. Cook over high heat for 5 to 8 minutes; drain and set aside. 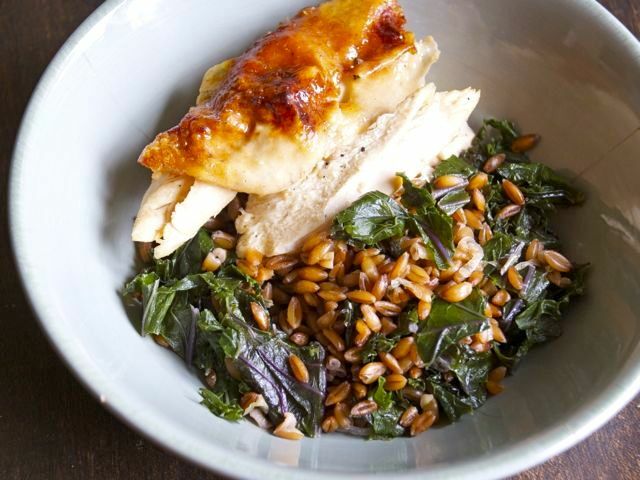 Combine the toasted farro with 2½ cups salted water in the saucepan. Bring to a boil, lower to a simmer, cover and cook for 20 to 30 minutes. The cooking time will vary according to the variety of farro, whether there is some or all of the husk still on, and how long ago the farro was harvested. Drain the farro. Heat a medium cast-iron skillet or other heavy-bottomed pan over medium heat. Add 2 tablespoons of the olive oil, the spring onion, and garlic. Stir-fry for a few minutes, until the onion is just tender and beginning to brown. Add the farro along with the remaining tablespoon of oil and continue to fry to encourage browning, constantly stirring to avoid burning, about 6 to 7 minutes. After the farro is fried, add the herbs and about 2 cups (or more) of the cooked greens and warm through. Serve immediately.